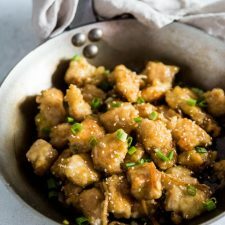 Every time you see those FoodPorn-style Chinese takeout pictures that have crispy chicken bites with shiny sauce, you get super excited and decide to challenge yourself to try a new recipe, only to find out it calls for deep-frying in the first sentence. Don’t you just hate scenarios like this? It gives most people a giant headache even without stepping into the kitchen! Who wants to use 4 cups oil in a simple stir fry dish? It’s messy AND expensive. Who has the time to wait for the oil to heat up to the perfect temperature (it takes more than 15 minutes if you’re using an electric stove) , and spend another 20 minutes to deep fry everything in small batches? What I’m suppose to deal with the hot oil once I finish the deep frying? Most home cooks might not want to lift a 14-inch wok right from the stove and pour cups of smoking hot oil into a bowl that is 10 times smaller. 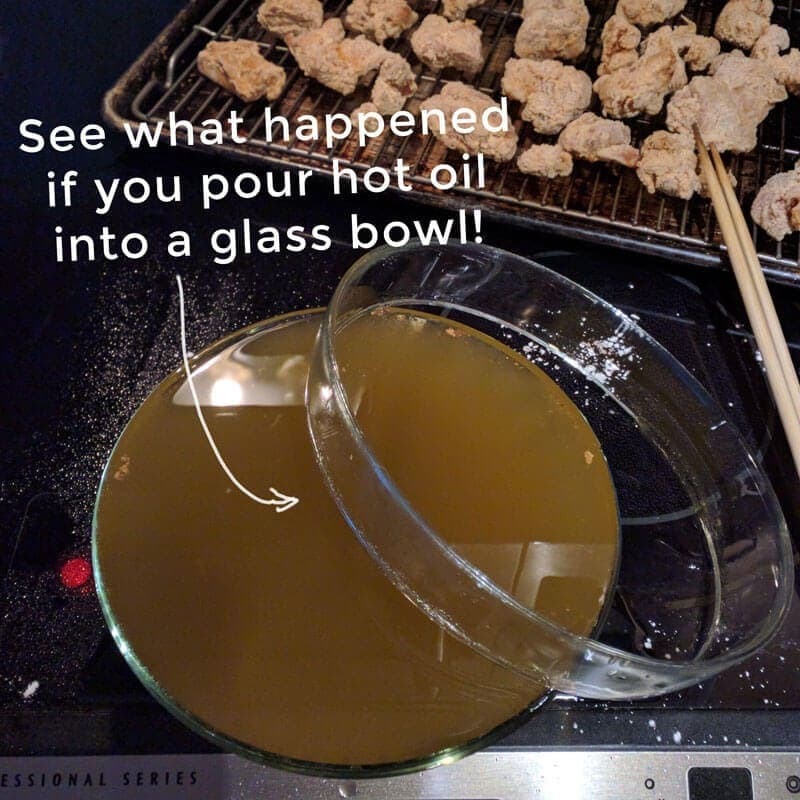 I once accidently poured leftover deep-frying oil into a glass bowl (it was the nearest bowl I could grab that was marked heatproof), and half the bowl immediately broke and fell apart. “Luckily” the bottom of the bowl stayed intact so I didn’t need to face 4 cups of hot oil running all over my kitchen counter. After that accident, I was traumatized and decided to develop a recipe for crispy chicken without deep frying. 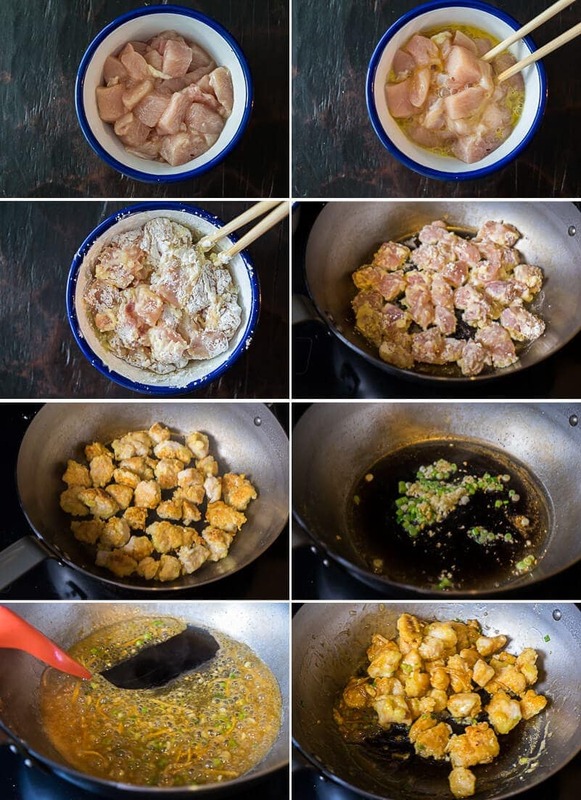 Now here is the trick to create crispy chicken with a crunchy coating that is like the takeout you order from Chinese restaurants, without making a mess. Choose your favorite cut of chicken and cut to 1-inch to 1 and 1/4-inch pieces. The size of chicken pieces matters because you want the surface to turn crispy and have the inside just cooked through at the same time. It doesn’t matter if you use breasts or thighs. I’ve tried both and they all turned out awesome. Mix the chicken with salt and oil, let it marinate for 10 to 15 minutes. You can skip marinating if you’re short on time. Here I use salt instead of soy sauce or any liquid seasoning, which prevents oil splatter during cooking. Beat an egg and mix to coat the chicken. It works as the glue that holds the batter together. Plus, it’s delicious and creates wonderful texture. Add cornstarch. Keep mixing until there is little dry cornstarch left on the bottom of the bowl, and most chicken pieces are covered in a semi-dry coating. It doesn’t matter if the chicken is not coated evenly. The uneven batter creates AMAZING texture. That’s is! Now you’re ready for the pan frying. Heat up just enough oil to coat the pan. I used a 24-inch deep skillet. You can use any large skillet or a dutch oven. Add ALL the chicken and immediately spread them by using a spatula. The chicken pieces will stick together, but it’s fine. If you’re using a nonstick or carbon steel pan, separate the chicken pieces by using a pair of tongs (or a pair of chopsticks). If you’re using another type of pan, the meat might stick at first. Let the chicken cook for 1 minute before moving the pieces, so the meat will detach from the pan easily. Brown both sides of the chicken. If the pan gets too hot and the oil starts to bubble too vibrantly, remove the pan from the stove for a few seconds and turn down to medium low heat. One last step (very important): transfer the chicken to a big plate and give it 2 to 3 minutes to cool down. The coating will get crispier. Remove the hot pan from the stove to cool off a bit, so it won’t burn the sauce and herbs the second you add them into the pan. NO deep-frying and pouring hot oil required. You can use a thin layer of oil that is just enough to cover the bottom of a frying pan. You can add the chicken all at once. No need to dip each piece in batter and fry one piece at a time. The batter is designed in a way that creates a super crispy texture that STAYS crispy after mixing in sauce, and even the chicken turns a bit cold. The coating sticks well to the chicken, so it won’t fall off and cause a mess in the pan. The batter causes almost no (or very minimal) oil splatter during cooking. You will not have any oil splatter on your stove by using a pan with a higher edge or a dutch oven. (Yes, you can make the whole dish in a dutch oven!). Lastly, you only need 5 to 6 minutes to cook a batch of crispy chicken – that is 4 times less than deep-frying. Once you have tried this method, you won’t need to hunt down another recipe to create crispy chicken! 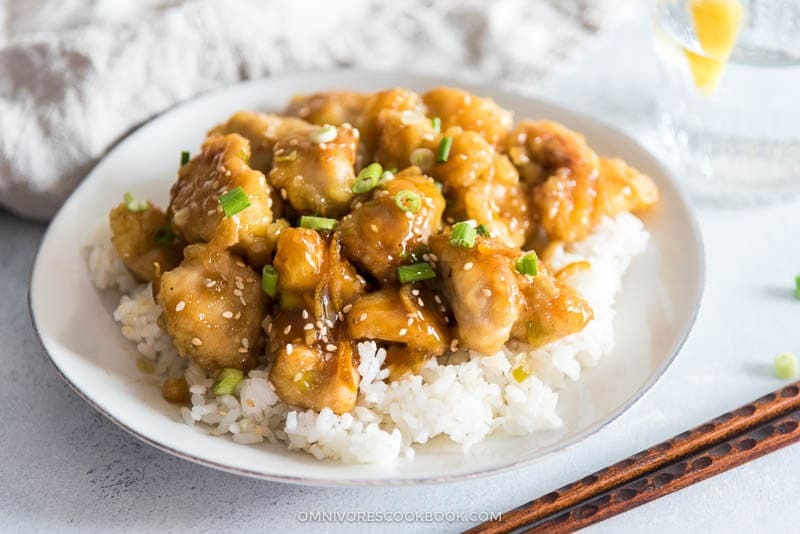 If you like the orange chicken sauce in this recipe, check out this post to see how to make a big batch ahead of time so you can save prep time later. This recipe used the pre-made orange sauce. If you didn't make the sauce, scroll down to see the other recipe below. 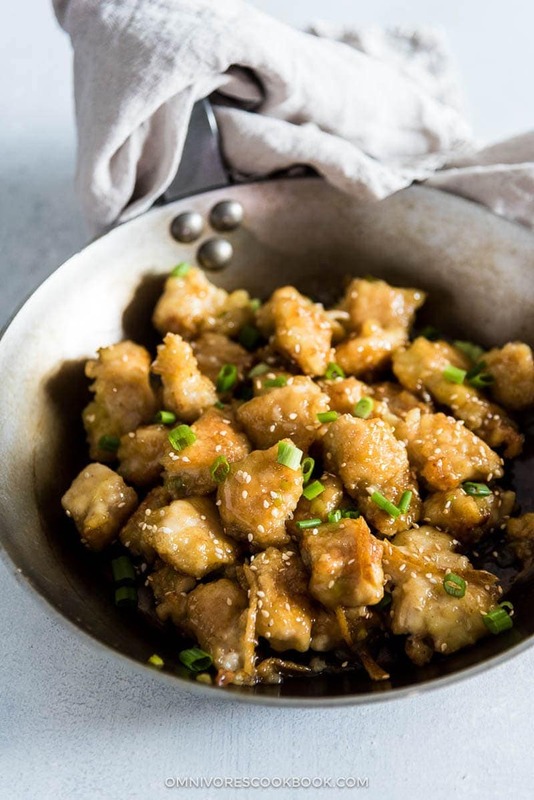 Add chicken back to the pan and pour in the homemade orange chicken sauce. Stir to mix well. While marinating the chicken, prepare the sauce. Add dried tangerine skin in a small bowl and add hot water to cover. Let soak for about 20 minutes, or until the tangerine skin softens. Drain and finely slice. Transfer 2 tablespoons sliced tangerine skin into a bowl, and save the rest in an airtight container in the fridge for next time. If you do not use dried tangerine skin, grate orange skin to make 2 tablespoons orange zest instead. Add the rest of the sauce ingredients to the bowl with the tangerine skin. Mix well. Place the pan back onto the stove and turn to medium heat. You should still have 1 to 2 tablespoons oil in the pan. Add green onion and garlic. Cook and stir a few times until it releases its fragrance. Add back the chicken pieces. Stir to coat chicken with sauce. Add the rest of the green part of the green onions and garnish with sesame seeds, if you’re using them. You can use this recipe to cook 340 to 450 grams (12-oz. to 1-lbs) chicken. I love your version of orange chicken. I definitely give this recipe a try! Maggie, yum! I miss Chinese food because I don’t like the style that is made here in Malaysia. I am making this– and love that it isn’t deep fried. The method sounds really quick! I’ve never been to malaysia. What is the Chinese food there look like? Yes the crispy chicken is one of my favorite parts. It is way less messy and the result is as delicious! I’m averse to recipes involving deep frying for all the reasons mentioned here. I was delighted to find an alternative that sounds wonderful. I’m definitely making this. Dang this looks good. Im not a chicken eater but curious to give it a go with tofu! Your pictures and step by step instructions are so great as well. Found this recipe yesterday and within 2 hours my daughter and I were making it. It was as easy as you said and way tastier than I expected. Absolutely delicious!! We were so anxious to taste and eat it that we forgot to take pictures. Sorry! Next time I will try to get pictures. Now I want to try this for beef, fish, pork and shrimp. I’m not into veggies but will HAVE to try it on a few different ones. My daughters love all veggies. Also need to try chicken wings. The sauce will work very well with other meat and seafood as well, so do try them out! When you add the veggies, some onions and peppers will work out great. Yeow, scary result of hot oil to glass container! Thanks for posting such clear details of do’s and don’ts. Without, tangerine peels or zest, it still turned out really , really good. So tasty, I loved it. Can’t wait to try with missing ingredient. This is the best recipe and instruction for stir-fry I’ve found. Tried this recipe again just cause I love Orange Chicken and the first time I skimped out on the cornstarch. I only use organic cornstarch which seems to be five times the price as conventional. This time I followed the recipe exactly with the proper amount of cornstarch and we were all pleased with the crispy texture of the chicken, Ms. Zhu’s aka Maggie orange sauce, and the shallow fry technique. Gonna try this with thin fish fillets with the leftover orange sauce. This is definitely a five star recipe. Love your authentic Sichuan recipes. My wife has an intolerance for corn products, and corn starch. I’ve been using potato starch as a thickener. Will this work in your recipe? Excellent recipe. I may stop visiting Chinese restaurants but I will visit Chinese markets more frequently. It is worth the time spent. This will be the first of many recipes tried at my kitchen. I dried the orange peels myself and it made a big difference in taste vs using fresh orange zest (tried it in the past). I love the way you have embedded lints to allow me to better understand fundamental details (e.g. details about wines and what is the purpose of the alcohol). You provided with not just a recipe but real instruction. You are a great teacher. I am getting your book and will continue to study your blogs. A big yum! It’s very easy as you say. and delicious. So many of your recipes are exactly that. Why would anyone ever order out? Cooking at home one controls what ingredients go into one’s food- very important. I have been a huge fan of Cook’s Illustrated for many, many years and now Milk Street but if I want something simple to make and good I turn to your blog! Thanks so much Maggie! Keep the good food coming. Hi! Thank you!! 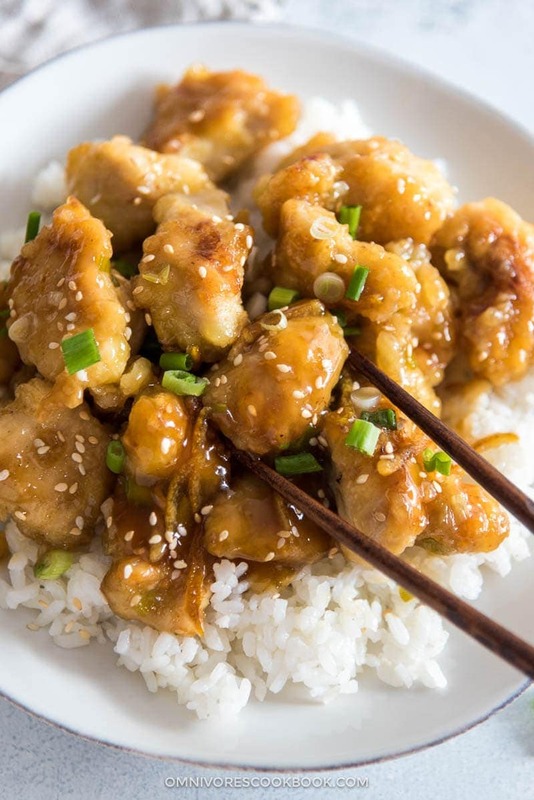 I just read this recipe and hope to try the orange chicken and marinade. 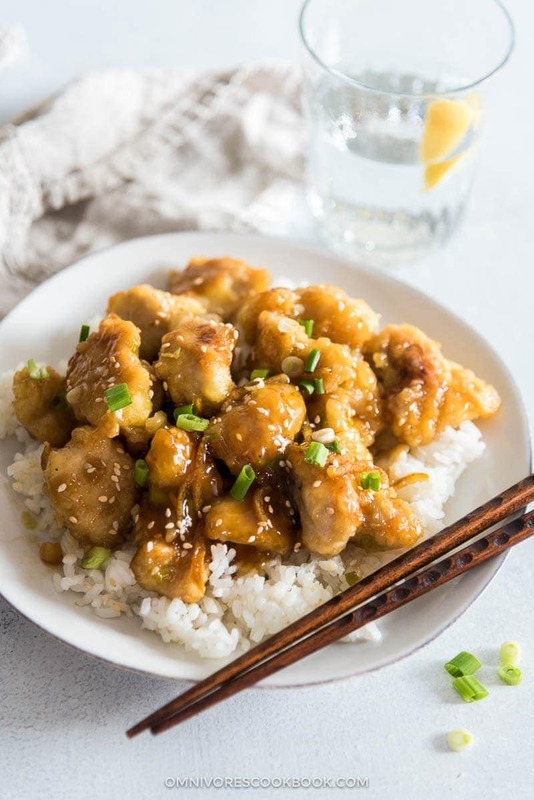 I was looking at ingredients of orange chicken Sauce from Panda Express bottle and wondered how to do it by scratch, to make a healthier and cheaper product. I googled a receipt and was lead to your recipe. I’ll let you know how it turns out once I try yours. Once again, Thank you!